Why don’t we steam you up? Heehee. I never noticed that fish can sometimes have blue eyes. Isn’t that cool? I found this 1/2 kilo or so reef-fresh lapu-lapu at the Nasugbu market last weekend and purchased it for roughly PHP180 or $3.50. Beside the blue-eyed lapu-lapu or grouper was a maya-maya or red snapper. Not quite the red snapper so prized in Western restaurant menus, but a close cousin, I think. Cooler, and more temperate waters seem to have a noticeable effect on the texture of the meat of red snappers when compared with their tropical cousins. I purchased both fish because I wanted to experience tasting their meat side by side to see if one really tasted better than the other. 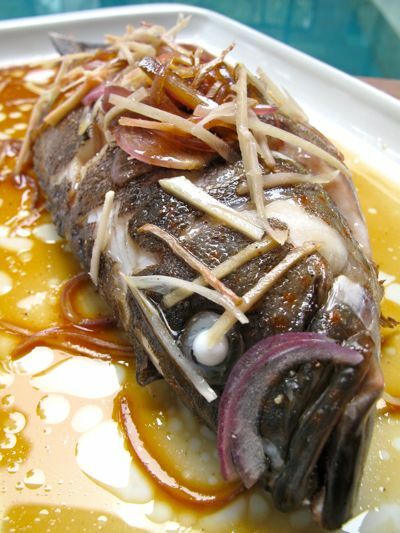 I simply steamed both fish for roughly 13-15 minutes on a HIGH flame with julienned ginger and sliced onions and added a sauce of light soy sauce, stock, pinch or two of sugar and some really hot oil. Both fish were good. But the meat of the maya-maya was a little bit mushier or less firm than that of the lapu-lapu. Personally, I thought the lapu-lapu was excellent, so the price premium over maya-maya (around PHP50-80 per kilo more for the grouper) is well justified. Yum. 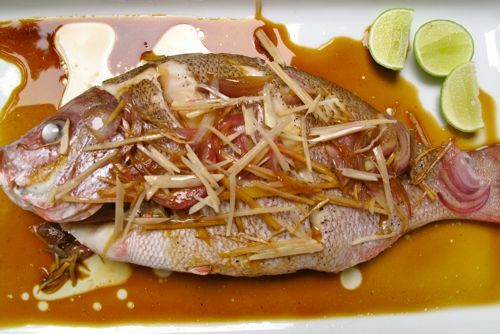 Do you know if lapu-lapu is typically available in American supermarkets? If so, should I just go to the fish counter and ask for grouper? fried-neurons, to be honest, I have never purchased grouper at an American fishmonger. But I suspect it IS available, and yes, as grouper. Alternatively, red snapper, weakfish or sea bass might work nicely instead. i remember that we were actually TRAINED to go for the steamed lapu-lapu when we were in a chinese restaurant buffet! the light and thin sauce (light soy sauce) combined with the meat of the grouper makes for a very tasty and not so filling meal that has you coming back for more! waaaaaaaaaaa!!! i’m hungry! A nice looking lapu-lapu up there, I wonder if those are hybrid from a western lapu-lapu :). Steamed fish is first on my list for this fresh fish although I don’t mind it on Pesa with ginisang miso as a dipping sauce. Haha, I was just thinking the other day what lapu-lapu was in English. Thanks for the info! Jen, not sure if Canada uses American nomenclature, but if not, another choice is rock cod which is the name Australians use to describe groupers or lapu-lapu. Inconsistent fish names even within the same country are a constant cause of confusion; trying to work out the corresponding name in another country is a nightmare. As Marketman says, Australians call lapu-lapu red rock cod, but we also have grouper here which are a different fish altogether, coming in blue and brown varieties. 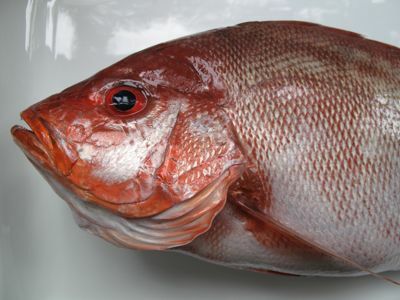 I don’t think Filipino red snapper is as closely related to Australian snapper as it is to the fish we call red emperor. And my mention of Australian swordfish caused a lot of confusion with my Filipino partner until we worked out that it’s nothing at all like espada. Anyway the important thing is that it all tastes good :). Hi MM. Interesting that you said that the blue-eyed lapu-lapu is fresh. My husband and I examined the picture and agreed that the eye looked more cloudy than blue. We’re both practicing marine biologists and we visit the local market weekly to buy the freshest fish to study (and eat afterwards!). We don’t mean to rain on your parade, but honestly, we thought that the lapu-lapu could be more fresh. We also read your previous post, and thought that we can add another tip for buying the freshest fish: the eyes shouldn’t be sunken (like the red lapu-lapu in the 4th picture of your previous post). 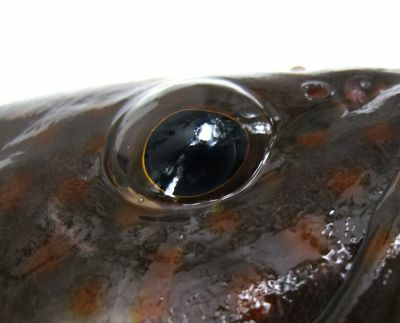 We don’t mean that the eyes should ‘pop-out’, since this may also indicate that the fish was pulled from deeper water quite quickly and didn’t have the chance to decompress. Although the camera shot can be deceiving compare to the actual one that MM saw. But it’s good to know some of the fact from Nadia. How long can a fresh fish stay fresh in terms of hr? Assuming the fish was caught at around 2-3am from a nearby sea and probably reach market at around 5am. What is the best time to get it in the market still fresh? Nadia, cool, thanks for those tips, much appreciated. 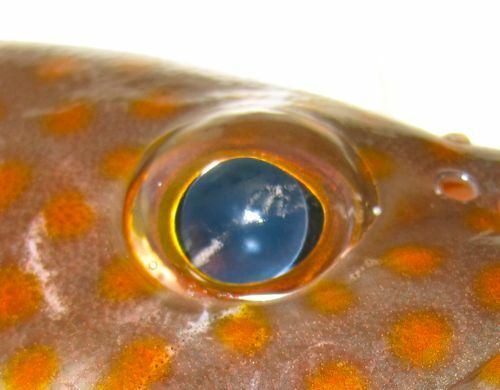 Actually, I thought the lapu-lapu eyes appeared quite clear in person, but the photo does seem to suggest it is a bit cloudy… I added another photo of the same fish at the bottom of the original post. This one does not capture the blueness but it does look clearer. But thanks for your comments. One also needs to look out for dynamited fish that appear okay, except that their internal organs can be ruptured… On another note, we also bought brilliant looking fish once, but got horrific food poisoning, probably from trace amounts of cyanide… yikes. MM, another great fish for steaming is white Pompano, espcially if you come across a very fat one. that is one awesome shot of the fish eye. yes, i agree with sonny sj…pompano is also great for steaming. That looks yum! I see coral trout ( some dark and some are red in colour in the seafood shops which look like our lapu lapu in the Philippines)I have not tried it though. I will try it sometime. The maya maya looks like the snapper I see at Costi’s . i envy those who can readily cook lapu-lapu like this. the seafood offering at our town’s market is pitiful with only tilapia, hito, bangus and a couple of shellfish. the fishmongers(at least the ones i asked) don’t even know what a lapu-lapu looks like! 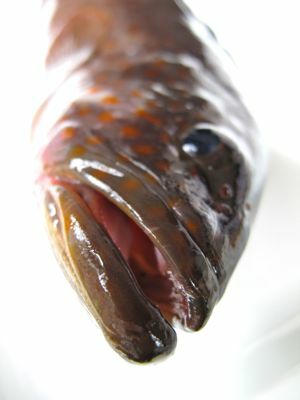 Where is the best place to buy fresh fish (snapper or lau-lapu) here in metro manila? MM, thanks for another good post. You mentioned about APAHAP. It was decades ago since I last enjoyed one. I can no longer find it in our wet markets in Bataan. I really don’t know the reason except perhaps, like many of our other fish species, it’s already near extinction, sadly. Will really appreciate it if you can kindly give tips on where the fish might be available in Metro Manila or nearby provinces? Many thanks. Hammour is the lapu-lapu of the Arabian (or Persian, depending on which side of the gulf you live :-)) Gulf. It is way way better tasting than our lapu-lapu in the Philippines. They used to grow upto 30 kilos each (and very cheap) when I first came to Saudi Arabia. However, due to overfishing they are pretty rare and very expensive nowadays. When I first came to Saudi Arabia, the head is given free of charge,,, think about sinigang … heaven! But now everything is sold, including the guts i reckon, hehehe. Hi there, i am a follower, just out of curiosity, what do you do for a living? :-P i know it’s kind of personal.. but maybe naiinggit ako bec. you have the time/luxury doing the things you like/love..
Marketman, i’m happy to see new blogs in your site. I thought you planned to stop writing for a while so i also stopped checking. Then I thought i would just read the old blogs much to my surprise… great to be reading your stories again! hi, I love this site and i follow this. May i ask permission to use some of your photos in my blog and i am going to link it to you site. thanks.